Aereo, a startup that raised ~$US100 million in venture funding, has filed for bankruptcy. The company’s plan was to change the way we watch TV. It was delivering broadcast TV through the internet. To do this without permission from TV companies, it thought it found a legal loophole that involved using antennas. It turns out, Aereo had no legal loophole. The Supreme Court said the company was operating illegally. Aereo’s CEO had repeatedly said there was no plan B for the company. It was either going to win its legal fight with the Supreme Court and grow into a massively successful business, or it was going to lose and the money would essentially go up in flames. A little over three years ago, the team at Aereo set out to build a better television experience for the consumer. We began this journey because we were frustrated with a system that we believed was broken and no longer served the consumer. When it came to watching live television, the options were few, the products available were cumbersome and didn’t fit our increasingly mobile lifestyle, and costs were unreasonably high and rising. With that in mind, we put our collective engineering power to work to create an online technology that was simple, useful, and compelling, and provided consumers with a true alternative to how they watch local live TV. That’s how Aereo came to life. Our engineering team created the first cloud-based, individual antenna and DVR that enabled you to record and watch live television on the device of your choice, all via the Internet. In less than two years, we went from drawings on a napkin to launching Aereo’s technology in more than a dozen cities across the country. The enthusiasm we encountered was overwhelming. The sense of frustration consumers expressed reinforced our mission. We knew we had touched a nerve, had created something special, and had a built something meaningful for consumers. But we encountered significant challenges from the incumbent media companies. While we had significant victories in the federal district courts in New York and Boston and the Second Circuit Court of Appeals, the reversal of the Second Circuit decision in June by the US Supreme Court has proven difficult to overcome. 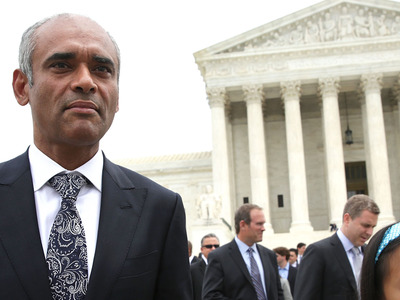 The US Supreme Court decision effectively changed the laws that had governed Aereo’s technology, creating regulatory and legal uncertainty. And while our team has focused its energies on exploring every path forward available to us, without that clarity, the challenges have proven too difficult to overcome. Accordingly, today, we filed for Chapter 11 reorganization proceedings. We also appointed Lawton Bloom of Argus to serve as Aereo’s Chief Restructuring Officer during this period. Chapter 11 will permit Aereo to maximise the value of its business and assets without the extensive cost and distraction of defending drawn out litigation in several courts. We have traveled a long and challenging road. We stayed true to our mission and we believe that we have played a significant part in pushing the conversation forward, helping force positive change in the industry for consumers. We feel incredibly lucky to have had the opportunity to build something as meaningful and special as Aereo. With so many shifts and advances in technology, there has never been a more perfect time to take risks, challenge the status quo and build something special. Thank you for all of your support. Your emails, tweets, Facebook posts and letters have meant the world to us. We are incredibly grateful to have gone on this journey together.